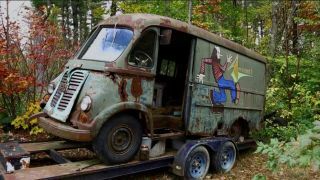 Aerosmith's first tour van has been found abandoned in woods near Chesterfield, Hampshire County, Massachusetts, about 110 miles west of Boston. The van's authenticity was confirmed by Aerosmith guitarist Joe Perry, and by Ray Tabano, a founding member of Aerosmith. Tabano was in the band from 1970 to 1972, before being replaced by Brad Whitford. How the van came to be in the woods is unclear, although the property owner claimed he originally purchased the land from "someone with a connection to Aerosmith."